Cable Tie Express products are shipped in solidly constructed, well-sealed plain corrugated cartons which for most customers is preferred as the plain boxes eliminate the need, time, and cost spent in repackaging product. A simple descriptive label is affixed to the cartons providing complete information of the contents within the carton, a most helpful tool for individuals in shipping and receiving. As an option to the standard descriptive label, Cable Tie Express offers custom labeling on cartons and/or on individual bags of cable ties – guaranteed to promote the distributor’s company name in the field and provide valuable information to their customers. Cable Tie Express distributor customers can enjoy customized carton labels affixed to two sides of the carton. Custom labeled cartons speed up the shelving of boxes and enable easy identification of parts noted on packing slip for individuals in receiving. 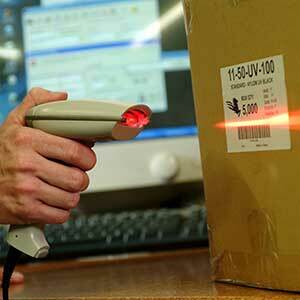 Quick identification and quick product picking is assured with custom labeled cartons. Custom labeling also provides an excellent marketing tool, promoting the company name to the end user. 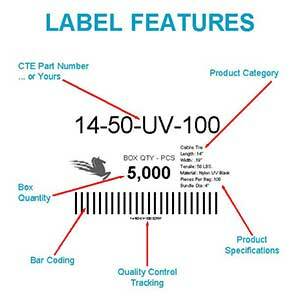 All of these clearly reflect the benefits and value received with the Cable Tie Express custom carton label program. Cable Tie Express products are packaged in either bulk bags of 1000 or 500 pieces or smaller packaged quantities of 100 or 50 pieces. As an option to the plain bag program preferred by many in the Cable Tie Express distribution network, a customized package program is available. This is the ideal method to promote the customer name to the end users and certainly is of great value to promote their company name in product showrooms. The end user can see at a glance the source for product as well as specifications for the product contained within the heavy duty plastic bag of cable ties and other products. Quick identification and product picking are additional benefits received when taking advantage of the Cable Tie Express custom package label. Have Questions about Custom Labeling? Give Cable Tie Express a call and let us design just the right label for your carton or package labeling needs!